Friday, 3/22 @ 6:30-8:30pm in the FDA Lounge, HW 8th Floor. Are you an Asian American/Pacific Islander dealing with family stress like disagreeing with your parents, feeling pressure to perform well in school, and being restricted in your options in life? Let’s talk about it! 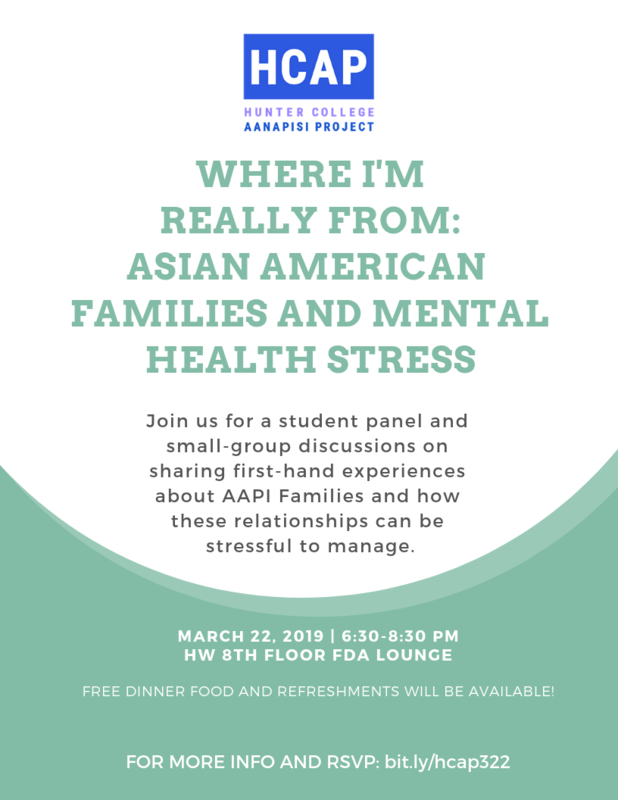 Come join us on Friday, March 22nd from 6:30-8:30 pm at Hunter West 8th floor FDA Lounge for a discussion about AAPI Families and how these relationships can be stressful to manage. The first half of the event will feature a student panel, sharing first-hand experiences of how familial relationships are tough to manage. The second half will provide space for small-group discussion. Free food and refreshments will be available!